The recent Wine Country fires were devastating, to say the least! Unfortunately, lives and thousands of homes were lost, not to mention pets, livestock, and livelihoods. And what about those trees, plants, and landscapes? Forest fires are a needed natural occurrence. They clear out overgrown areas, allowing sunlight to reach the forest floor — and encouraging a resurgence of native plants and an abundance of wildflowers. Native birds, bugs, and bees are drawn to the new growth, and they can reestablish themselves and thrive. Fire can destroy invasive species (including weeds) and eliminate, or reduce, plant disease and insects that can cause significant damage to old-growth forests. When the humus layer is reduced, several unwanted pests can be eliminated as well, including sawflies, red pinecone beetles, and maple leaf cutters. How do some trees and plants survive, when everything around them has burned? Native plants have root structures that can grow to 25 feet deep, and such roots are generally unaffected by a fire. 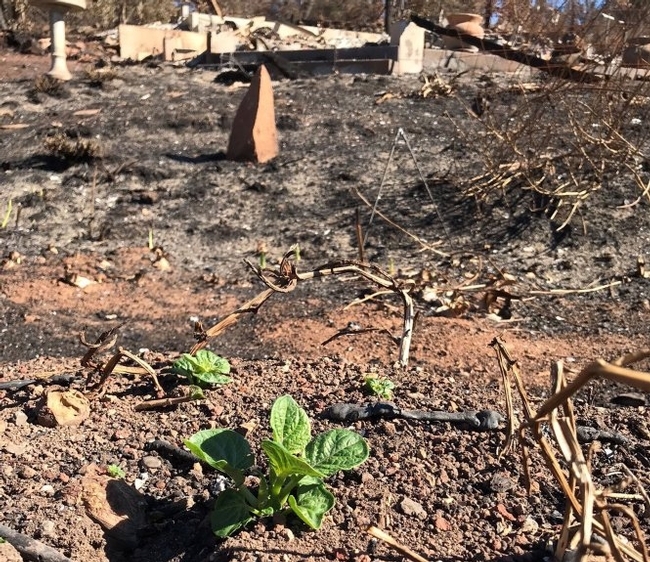 They bring moisture up, allowing the plant to sprout just a few days or weeks after the fire. Many trees that grow in fire-prone areas develop thick bark, which protects the inner (cambium) layer from damage. This layer is responsible for moving water and nutrients to keep the tree alive. Ponderosa pine is a good example. It has thick, flaky bark and drops its lower branches – which protects it from some fires. Other species, like the shortleaf pine or California buckeye, have extensive root systems and dormant underground buds that quickly re-sprout after a burn. Some species of pine (Jack, lodgepole, hickory) regenerate by fire-stimulated seed dispersal. They have serotinous (hard, thick, resin-sealed) cones that can hang on the tree for many years. Only when the resin is melted by fire are the cones able to open and release their seeds. Other plants such as Ceanothus, Coffeeberry, and Redberry have seeds with tough coatings and depend on fire to break their dormancy. Ash from burned trees and decaying plants can be beneficial, too. Nutrients (potassium, calcium, magnesium and other trace elements) that were held captive in old, decaying plant matter are released into the soil in ash, benefiting surrounding vegetation. Without wildfires, plant diversity can diminish significantly or disappear entirely. And without plant diversity, the ecosystem of native birds, bees and bugs would fail, leading to the extinction of some species. First, hose down your trees and plants. Wetting everything down will allow the surviving leaves to transpire (“breathe”) and will help nutrient-rich ash seep into the soil. After the waiting period, have large, dead limbs removed, but try to leave all new growth intact so that the plant can manufacture food. After about two years, you can start to make appropriate pruning cuts to reshape the plant or tree into a healthy and appealing form. Small plants that have been severely damaged can be cut to the ground. Many will re-sprout from the roots. If you have a prized tree or plant that you want to save, the worst thing you can do is move too quickly! It needs as many branches as possible in order to produce enough new leaves to recover. If you suffered significant or total landscape loss, you have an opportunity to rethink what you really want and need in your landscape. Consider replanting only native or Mediterranean plants, low-water options. Think about creating a fire-safe zone around your home by building concrete or stone walls, patios, and walkways. Don't over-plant vegetation close to your home — that will only add fuel to any future fire that gets started. Create fire-breaks using flower beds, gardens and appropriate ground covers close to your home. This article first appeared in the November 12 print issue of the San Jose Mercury News.